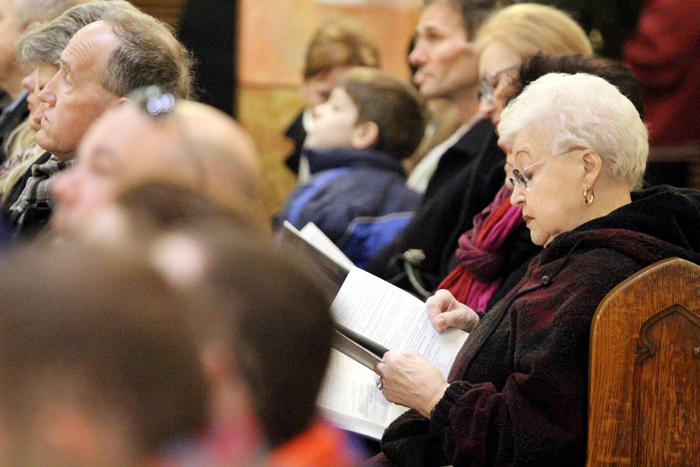 The St. Adalbert Choir leads the congregation in sacred music for the Mass. 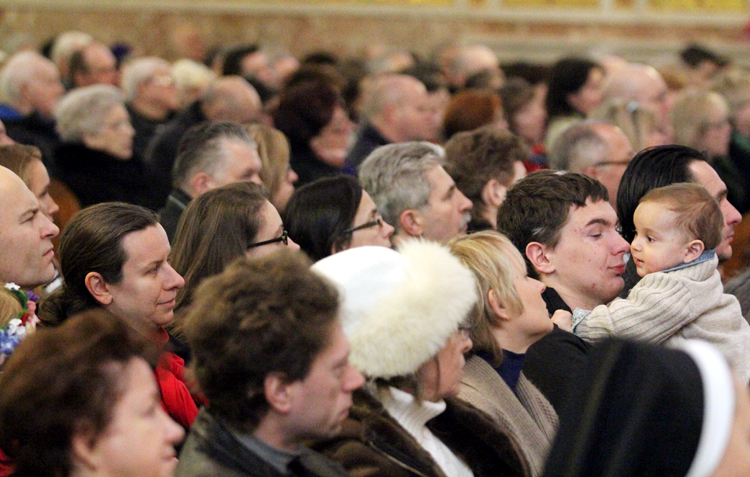 In rear at left is a portrait of St. Faustina Kowalska, a Polish nun closely associated with the Divine Mercy devotion who was canonized by her countryman, St. John Paul II. 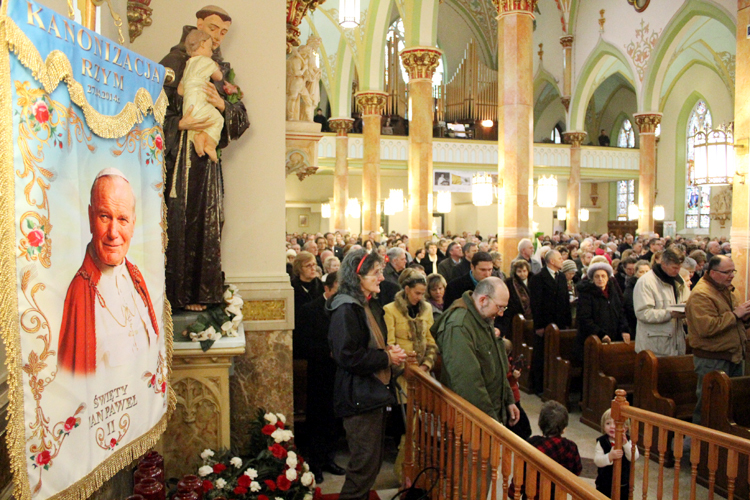 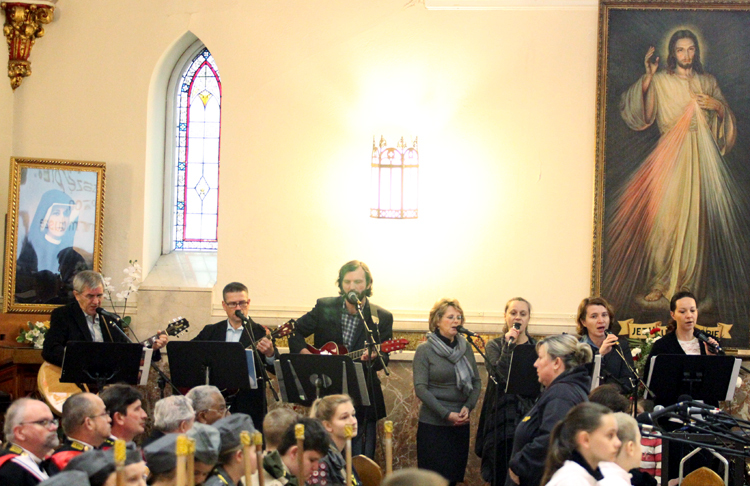 The many parishioners of Polish heritage maintain a strong devotion to the saintly Pope John Paul II, a banner (left) of which hangs in St. Adalbert Church. 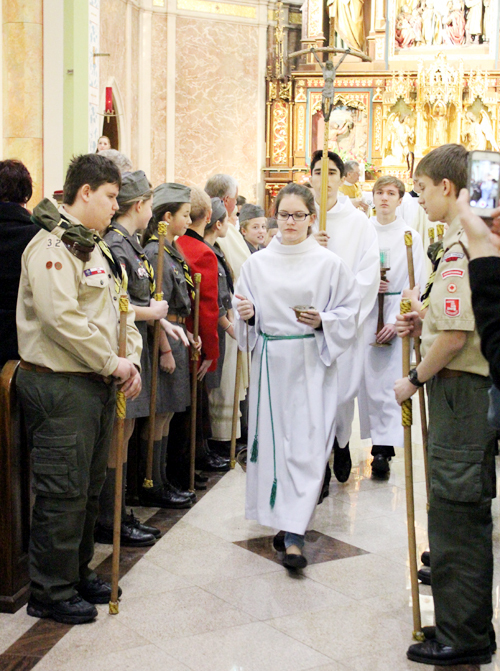 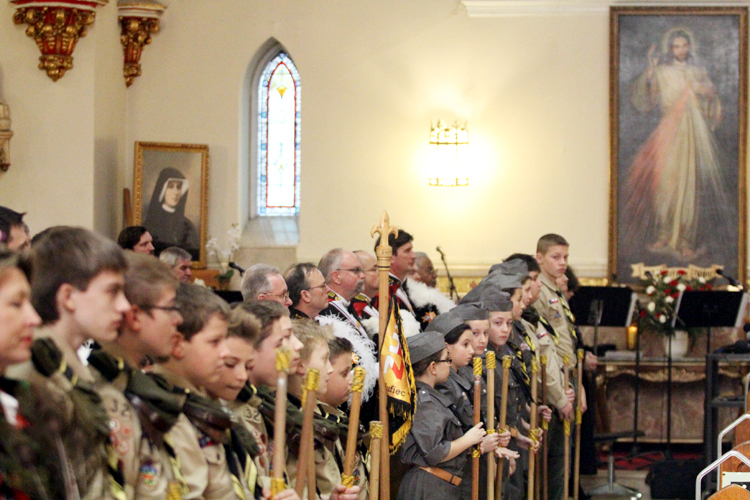 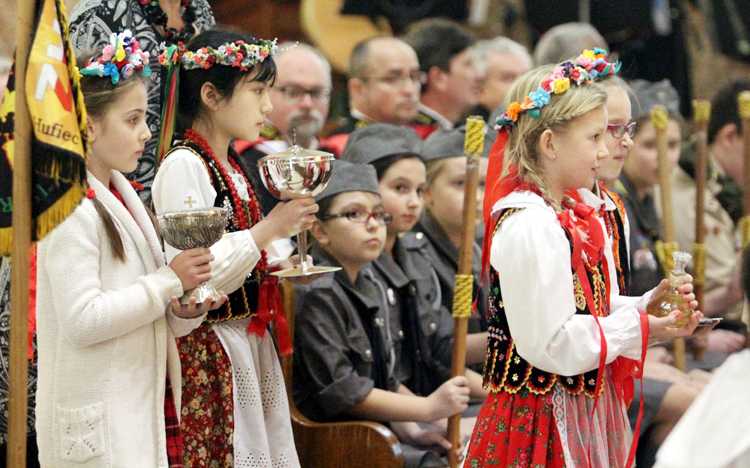 Members of the Polish Scouting Organization, Port Richmond Chapter, attend the Mass. 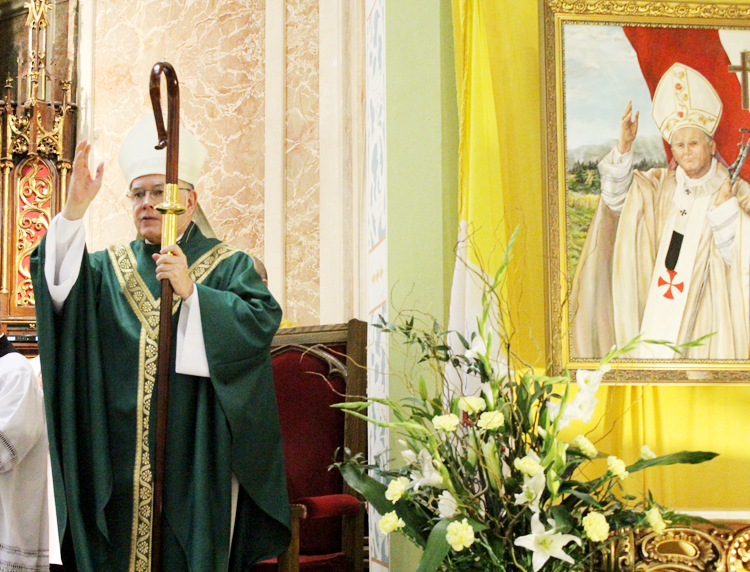 A portrait of Jesus depicted as the Divine Mercy (right) hangs near a portrait of St. Faustina in the church. 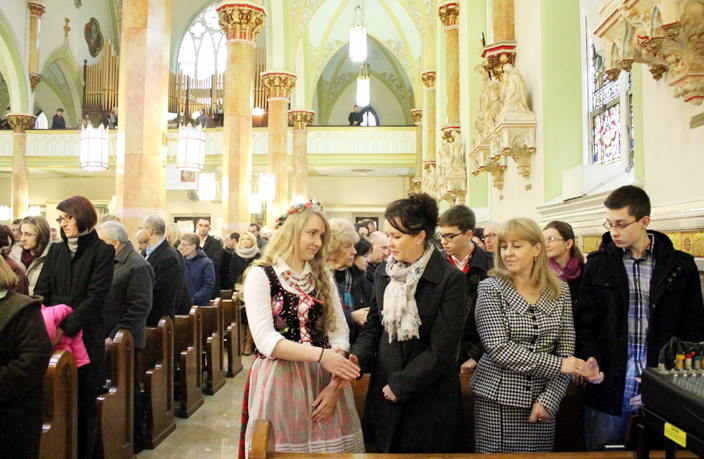 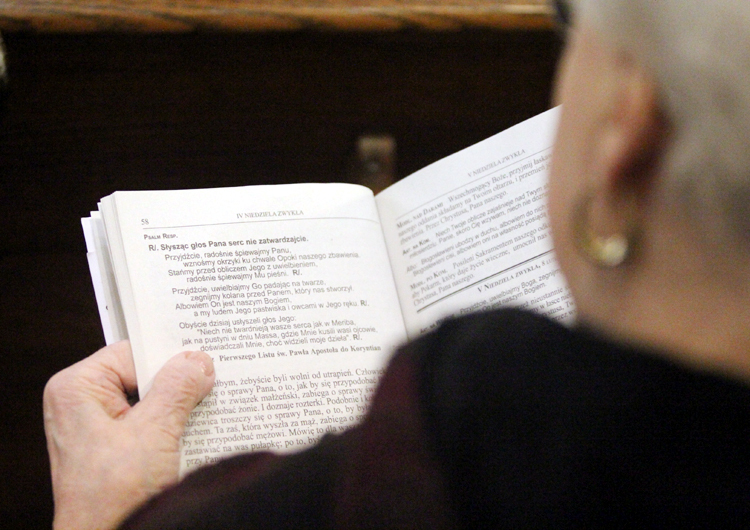 Regina Bartusevic follows the readings of Sacred Scripture in the Polish language. 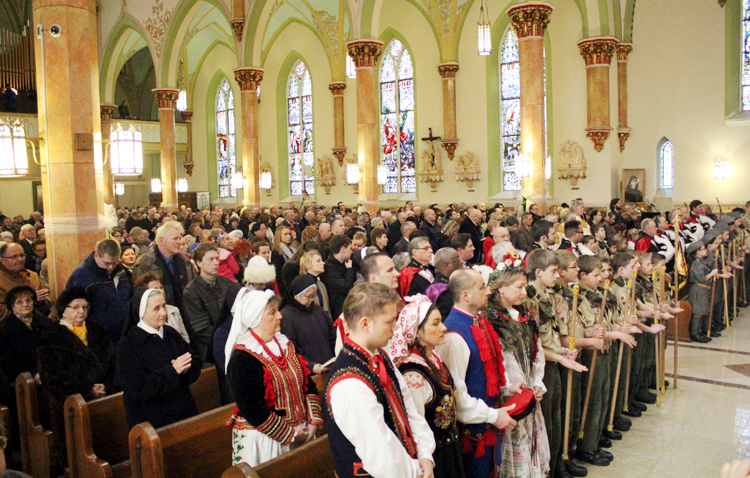 Many St. Adalbert parishioners dressed in the traditional garb of their homeland in the still-predominantly Polish parish. 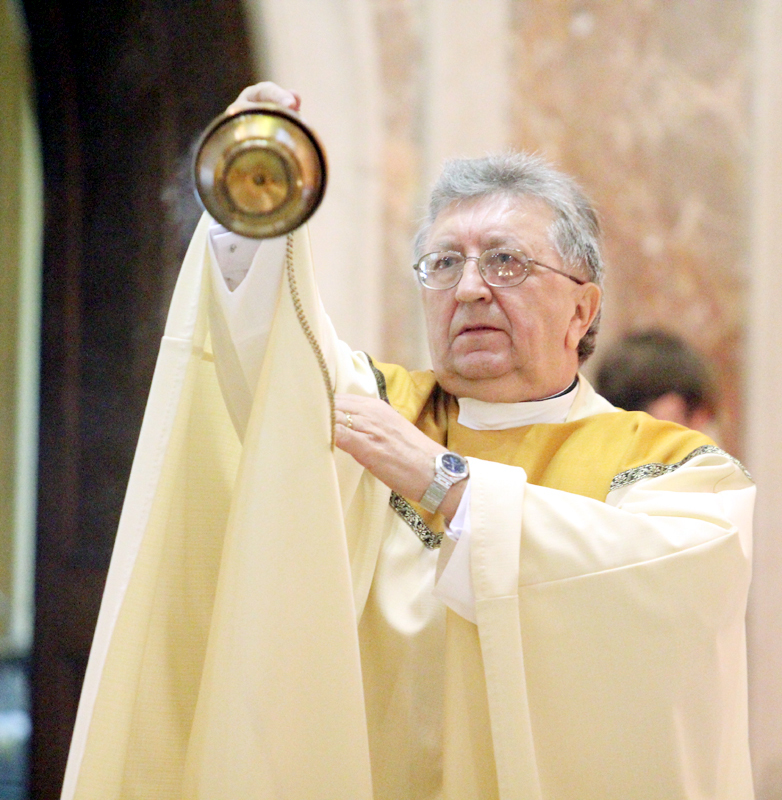 Father Jan Palkowski, pastor of St. Adalbert’s, incenses the altar during Mass. 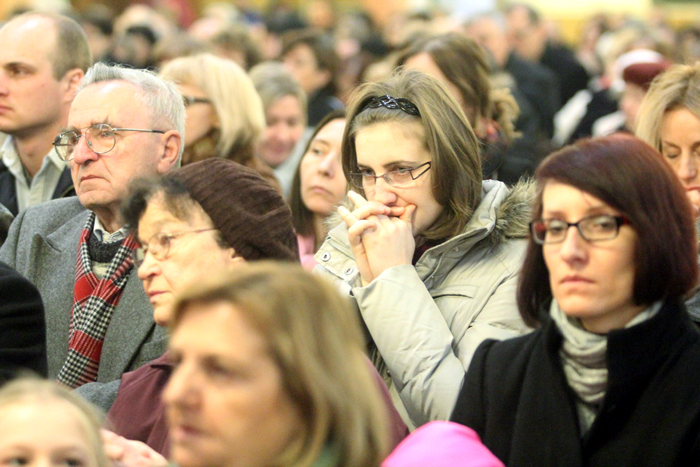 Worshipers exchange a sign of peace during the filled-to-capacity Mass at St. Adalbert’s. 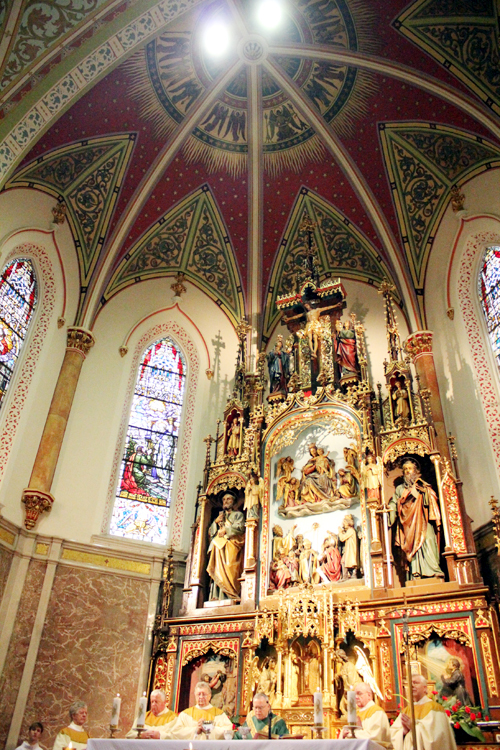 The beauty of ornate art and architecture fills St. Adalbert Church and reaches a crescendo in its spectacular sanctuary, where Archbishop Chaput celebrates Mass with other priest concelebrants. 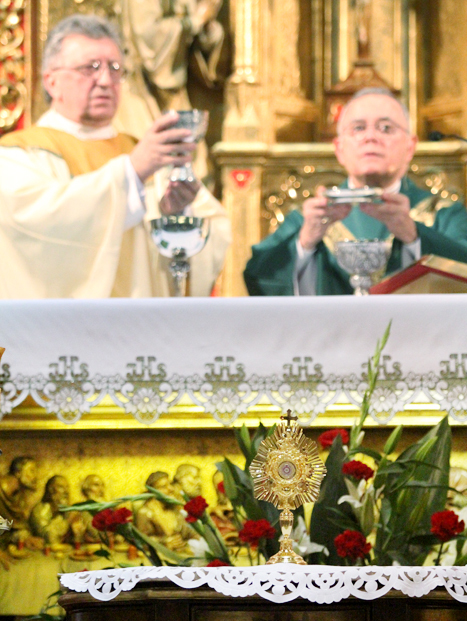 Archbishop Chaput and Father Palkowski elevate the Eucharist at the main altar, as a relic of St. John Paul II is displayed in front. 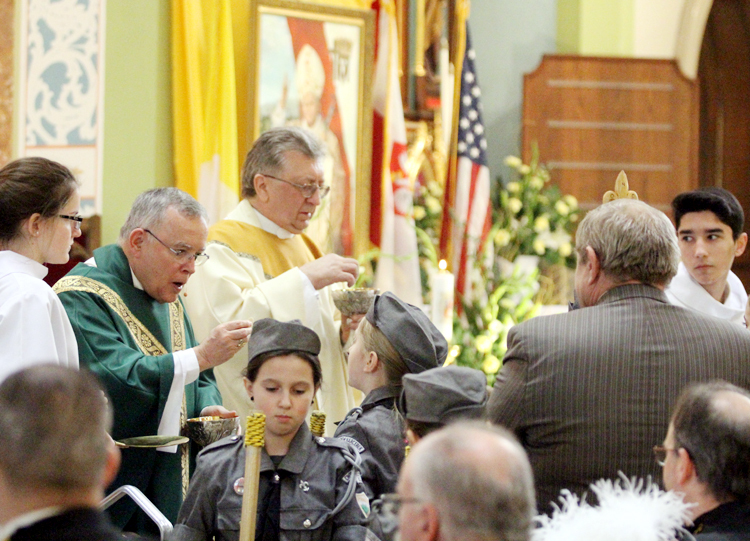 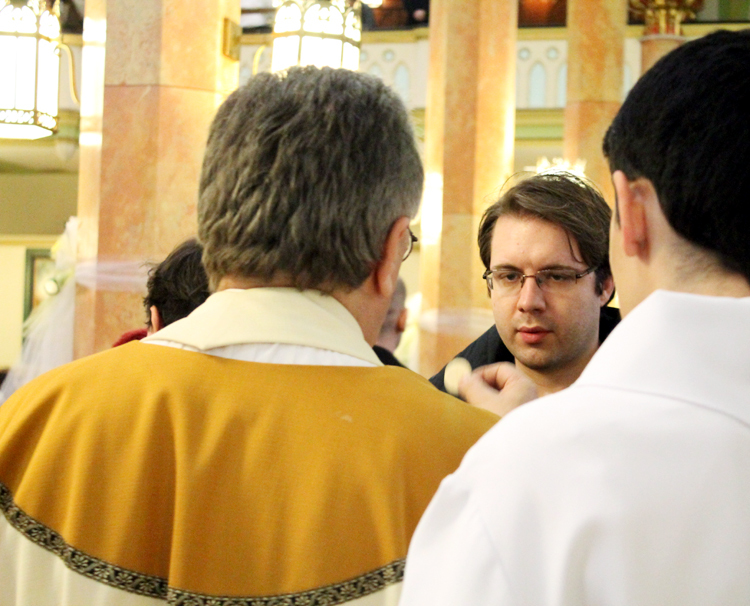 Archbishop Chaput and Father Palkowski distribute holy Communion to worshipers of all ages. 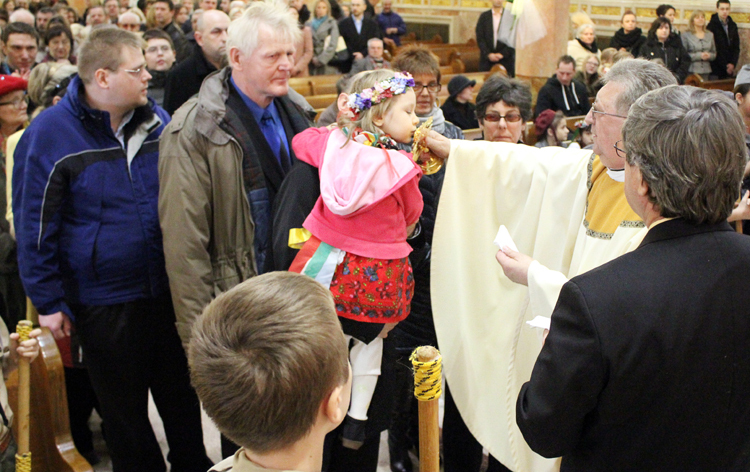 Little Derek Milewski (right) might not be looking the right way toward the altar, but his dad, Vincent, is. 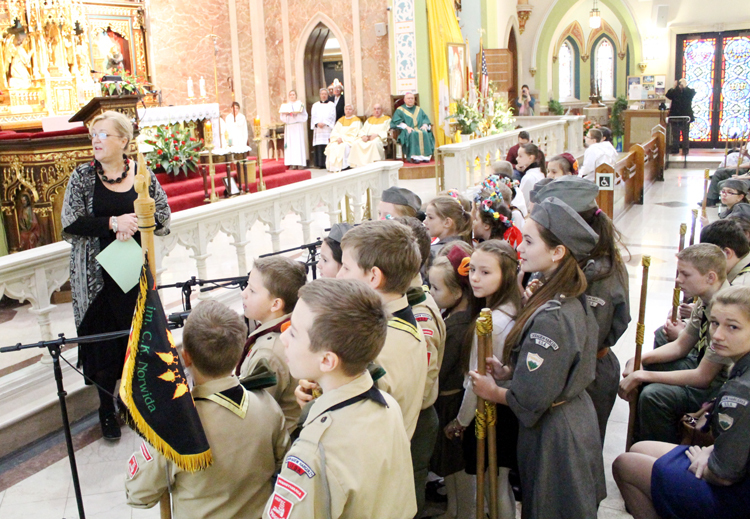 Children in their scout uniforms sing a song in honor of St. John Paul II. 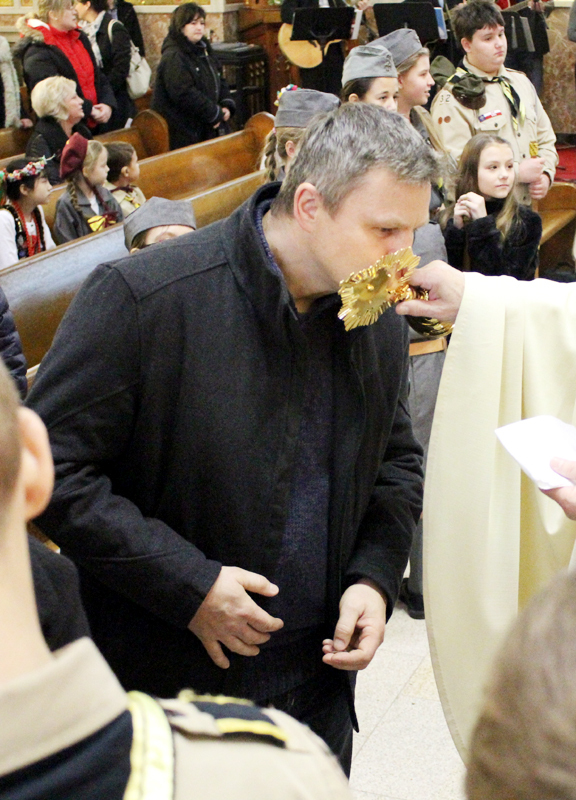 Paul Hajduk kisses the relic of St. John Paul II, which was made available for veneration by all after Mass.